Everything started with a friend’s reminding me of chickpea flour! 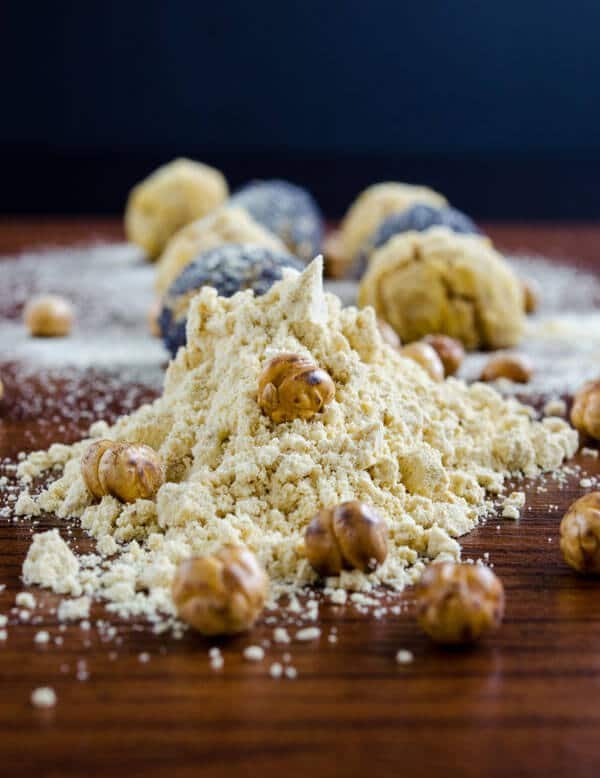 I asked a question on my facebook page the other day: “Which food reminds you of your childhood?” And one of the answers was roasted chickpea flour, which has a special place in childhood of Turkish people born in 80s. I almost forgot this amusing snack of my childhood! We call roasted chickpeas leblebi in Turkish and it’s one of our favorite snacks with drinks. It is also perfect to suppress your appetite or hunger. When roasted chickpeas are ground, that interesting childhood snack comes out! It was one of my favorite snacks just like spicy Chickpeas as Street Food. Roasted chickpea flour was sold in small packages in small local grocery stores and it was a terrific pastime activity for all kids then! Right, it’s a food turning into an activity! I think we weren’t much interested in its flavor, but we could find a great way to enjoy with it! 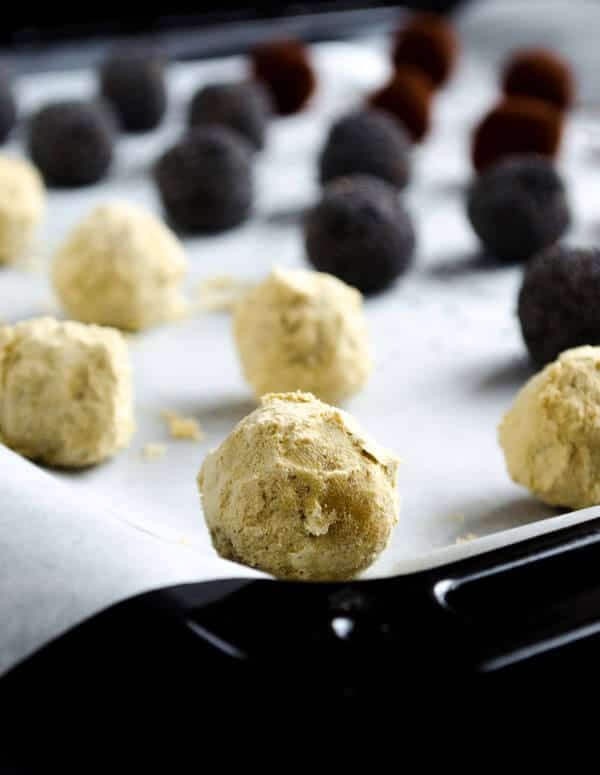 We would fill our mouths with roasted chickpea flour and spray it out! Sometimes we would organize fights with it. Can you imagine kids around you spraying chickpea flour from their mouth to each other? I’m sure it was disturbing for adults, but we were having so much fun! In some stores, it was sold with a straw in package and it was easier to spray out the flour through straws, the fight became even funnier! I don’t see packaged chickpea flour in grocery sotres today, you can find it at some special stores selling roasted chickpeas or at very big supermarkets. How bad that today’s kids don’t have any idea about chickpea flour fight! So when my friend reminded me of this special childhood food, a great idea came to my mind: Making cookies with it! And I bought a package yesterday! Chickpea flour cookies have a yellowish color and they are sometimes coated with extra chickpea flour. I wanted to go a little further though. And besides roasted chickpea flour, I coated them with poppy seeds and cocoa powder. These fantastic looking cookies were born this way! 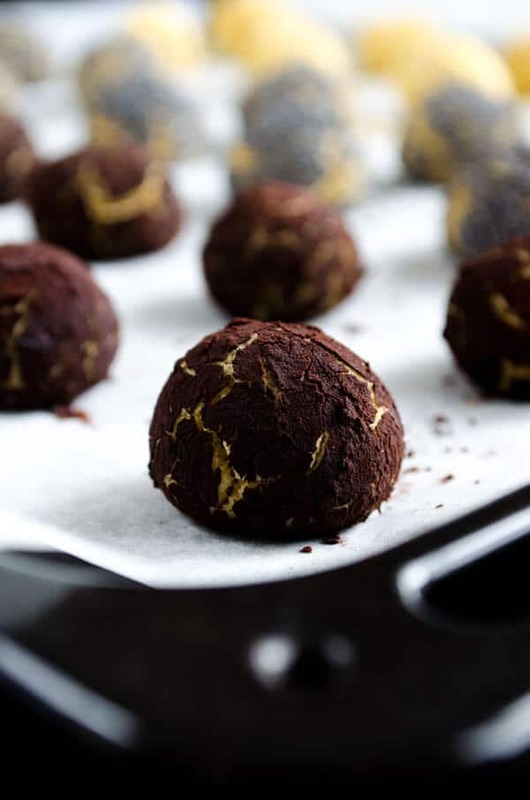 Poppy seed and cocoa powder coated cookies look even better than yellow ones. What do you think? You see how cocoa powder got darker when baked. Love the contrast between the dark outer side and yellow color filtering through cracks! Don’t worry about the cracks on these cookies, they are not that fragile when holding! Don’t you think the cracks give them a great look? These are not crispy cookies, they are a bit hard outside but melting in your mouth when you bite due to chickpea flour. You can use your own imagination and play with the coating ingredients. I sent this recipe to April’s Your Best Recipe event held by Spiciefoodie. 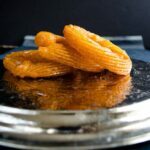 You can see other great recipes of April shared by other bloggers by clicking on the image above. Go check her lovely blog! She has amazing pictures there, all enough to make your mouth water! If you have a blog, you can send your favorite recipe of the month to that month’s round up too! 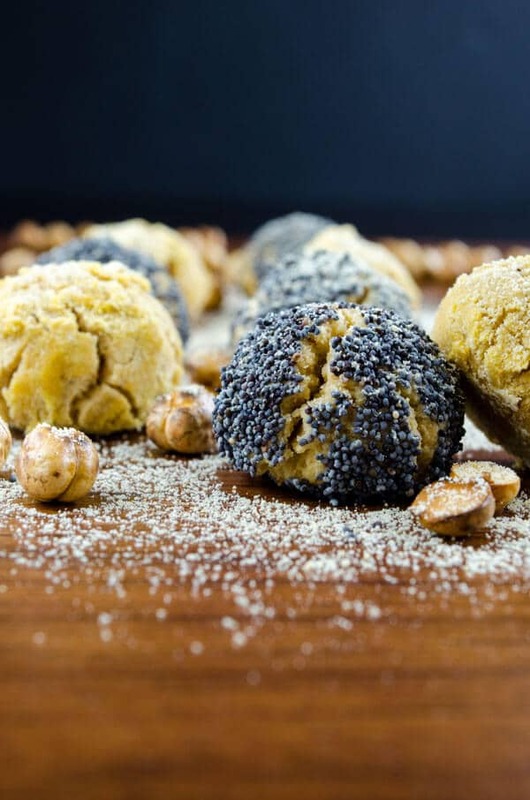 Chickpea flour cookies coated with cocoa powder, poppy seeds and chickpea flour. Mix all ingredients of dough and combine them very well with your hand. 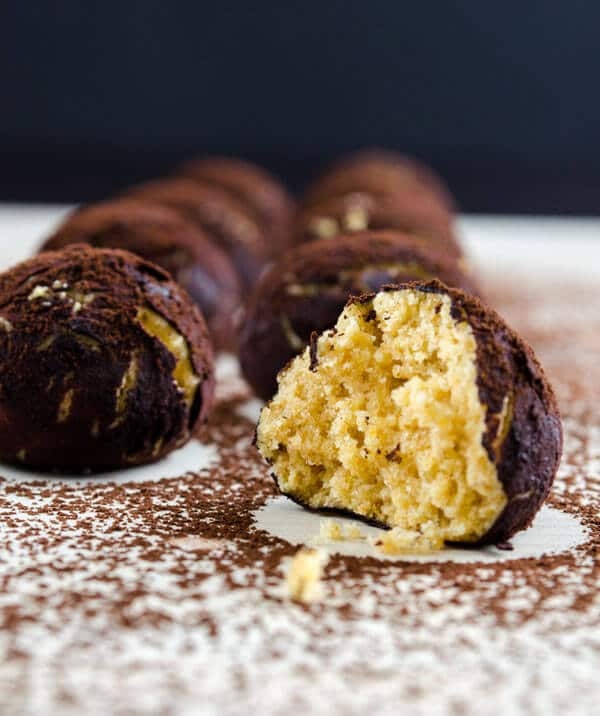 Make mini balls from dough. 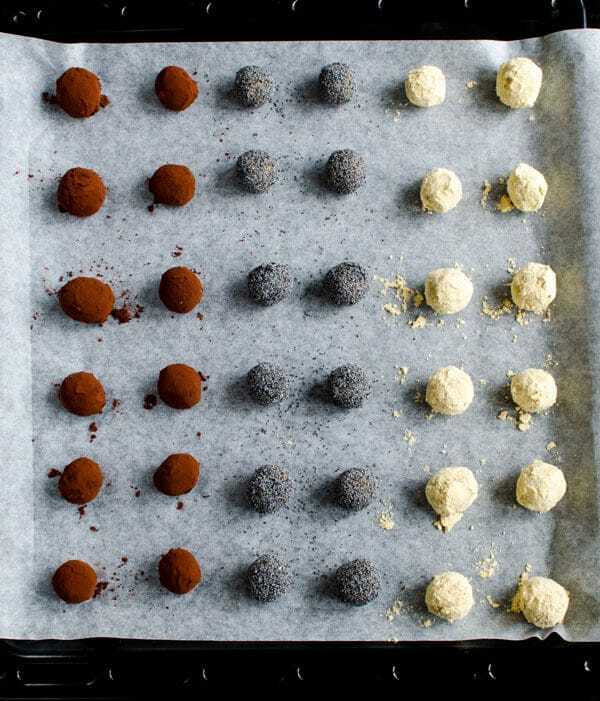 Dip them into whisked egg white first and then coat them with cocoa powder, poppy seeds and chickpea flour. Place them in baking pan. Wait them in refrigerator for 1 hour. Bake them in oven for 10 minutes. 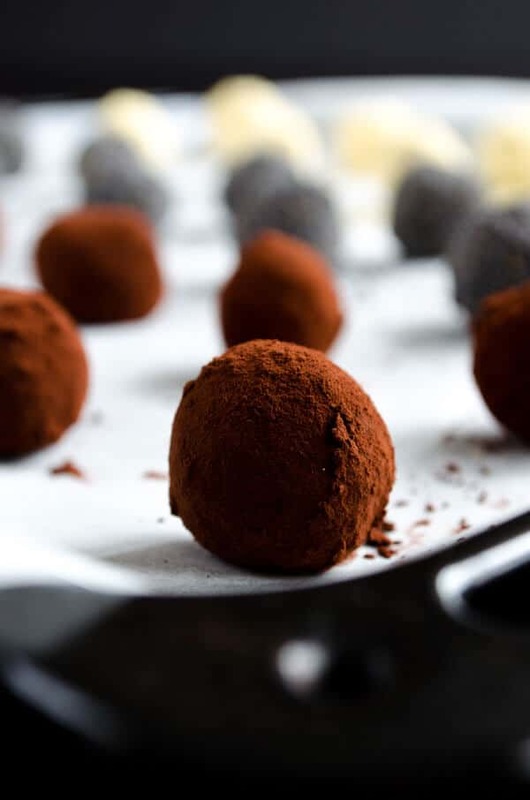 You can sift additional cocoa powder or chickpea flour over them when cold. These cookies are delicious ! I saw them on your blog and they are amazing! It’s a great feeling that you love and try my recipe! Thanks for sharing it on your blog! i love using chickpea flour for cookies! Aren’t they great to make soft cookies? I have a little experience with chickpea flour and mostly in savory dishes and very intrigued by these cookies. You must try chickpea flour in cookies too Roxana! You will see how soft they become! Haha that is a funny pastime Zerrin! I love chickpea flour! Have you ever made socca with it? It is like a big, savory flatbread. Very yummy just like your cookies! These are so pretty and delicious looking! You can imagine how we would enjoy! Never heard socca before, must search for it! Chickpeas and chickpea flour was real discovery for me..and I got to know about them not that long ago.. 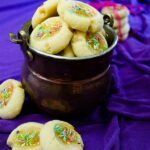 I didn’t even think about using chickpea flour for making cookies! I am so impressed and curious now! Chickpea flour gives a great soft texture to cookies, you must try and see! Interesting cookies! I have never used chickpea flour for making sweet treats… I’ll have to remedy that situation soon. You will love the softness of chickpea flour in cookies Rosa! 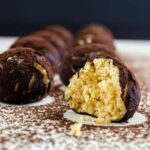 I love your blog and the unique recipes you feature. 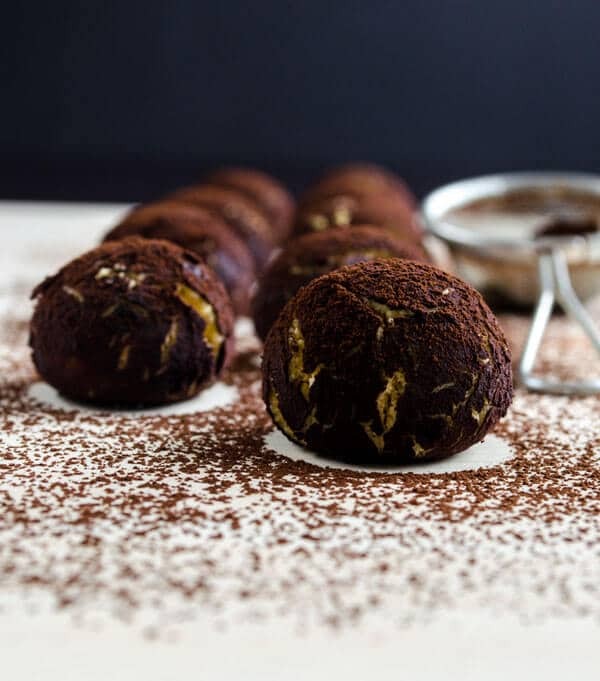 These cookies look beautiful – I look forward to trying this recipe! Thank you Aimee! Would love to hear he result when you try! 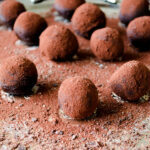 With the chocolate on the outside they look like chocolate truffles! Chickpea flour cookies are generally flat here, but I love them this way, just like truffles! These couldn’t look more beautiful…or be more unique! What a wonderful way to use the chickpea. Thank you so much for sharing! Thanks Monet! Could you imagine that chickpea or its flour could be used in a sweet treat? I wonder if I can use it plain in a cookie, will experiment on it soon!